RM Partners is rolling out a new streamlined pathway for patients with symptoms of colorectal cancer that we originally piloted in collaboration with St Mark’s Hospital, part of London North West Healthcare University Hospitals NHS Trust. Colorectal cancer is a common cancer which, if diagnosed and treated early, has a higher survival rate in adults. To confirm a diagnosis, the patient has to undergo specific tests to either rule out or visualise the cancer. Currently, this usually involves undergoing a colonoscopy which can visualise all aspects of the colon. The new pathway helps identify cancers more quickly by ensuring patients are referred by their GP using an electronic referral service, which is more efficient, and then contacted by telephone by a specialist nurse who uses a diagnostic algorithm to determine which is the most appropriate test or appointment for them. This could be a colonoscopy (which visualises all of the lower intestine including the colon), a CT colonography (which can visualise not only the lower and upper intestine but other organs, such as the kidney or liver), a flexible sigmoidoscopy (which only views the lowest part of the bowel) or an outpatient appointment. Changing the front end of the pathway, and including an alternative test to colonoscopy, enables patients to be diagnosed within 28 days from being referred which is much quicker than on the previous pathway. This means that if a patient does have colorectal cancer, treatment can begin earlier with the possibility of a better outcome. 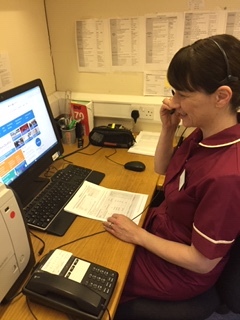 A patient satisfaction survey completed by those who have been through the new pathway found that around 98% rated introduction of the nurse-led triage and the telephone assessment appointment as ‘excellent’ or ‘very good’. The streamlined colorectal pathway is being implemented at a number of our partner trusts, including Croydon Health Services NHS Trust, Imperial Healthcare NHS Trust; St George’s University College Hospitals NHS Foundation Trust, Kingston Hospital NHS Foundation Trust and Chelsea and Westminster NHS Foundation Trust. For more information please contact Charlotte Carne.